In the movie “Up in the Air”, George Clooney plays Ryan Bingham, a corporate hatchet man who spends the majority of his waking hours on airplanes. He loves the traveling life, but, early in the film, Bingham’s boss decides to try a more modern approach, anchoring the habitual traveler to his desk and forcing him to use telepresence in place of face-to-face meetings. CIOs face a similar dilemma. Having made their careers within the walls of the datacenter, technology execs are under increasing pressure to sacrifice their familiar environment in the name of cost savings and efficiency. Unlike the grounded Bingham, however, CIOs are traveling in the other direction, from terra firma into the cloud. The question is: is the air up there too thin to survive? OK, I’ll try to take it easy on the hokey cloud metaphors. Still, it’s fair to wonder if the diversity, richness, and functionality of cloud applications are sufficient to the demands being placed on them. Fortunately, new classes of cloud solutions are appearing daily, and one of the newest of these is business process management (BPM). 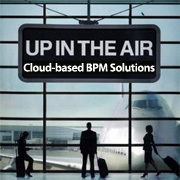 BPM has some advantages over other types of solutions when it comes to cloud deployment. BPM is a relatively new class of application, so products are generally already crafted for web-based usage. For the same reason, there are not a large number of “legacy” users who would require retraining. Finally, BPM databases are often not as huge as those of ERP systems or other big software suites, so latency is less of an issue (but not entirely irrelevant, as I’ll explain shortly). There are caveats. Although I personally think that security in the cloud is not nearly as big an issue as it’s made out to be, most C-suite execs are quite reasonably going to think twice before permitting highly sensitive data to travel offsite. That discomfort can result in a smaller (and, worse, less essential) domain of processes being made eligible for cloud-based BPM. In addition, although BPM databases themselves tend to be on the small side, the amount of corporate data needed in a typical end user interaction with a BPM form or report may be significant. The latency introduced by the Internet may slow performance enough to ruin the user’s experience. The more tightly integrated your processes are with your on-site corporate data, the more you may wish to keep your BPM solution on-site. End-user experience is critical. If users are waiting for forms to refresh or query results to appear, they will not thank you for your decision to move to the cloud. Your BPM vendor must provide both on-premise and cloud-based solutions, so you have the flexibility to change your mind without also having to change your vendor. Indeed, you should verify that the two solutions are actually identical—ideally, the exact same binary code—thus ensuring that you can quickly and easily transfer your processes, data, forms, and reports from one platform to the other. These ideas should help you balance the demands of your business with the realities of cloud-based BPM solutions. Eventually, moving your entire BPM portfolio into the cloud may be an easy decision; in the meantime, keep your users happy, your options open, and your data secure. Do that and you’ll be successful, whether in the datacenter or up in the air.